Share the post "4 Useful Google Translate Features You Didn’t Know About"
Google Translate* is a free online tool which provides translation in more than 100 languages worldwide. There’s not a lot of people who haven’t used Google Translate at some point in their lives, and it is available in a desktop or mobile app version. The app can be quite helpful in understanding our interlocutor or a written text while “on the go”. If you’re planning to use the app while traveling and without 24/7 internet access, download the language(s) you’ll need to communicate before you leave. That way, you’ll be able to use all the useful Google Translate features offline. Today we’ll talk about useful Google Translate features that you perhaps didn’t know even existed. *Google Translate is not completely accurate and some translations make us laugh out loud. Although technology is progressing rapidly and makes our everyday life easier, machine translation can’t replace translators. Imagine you are in a foreign country and need to follow street signs written in a language you don’t understand. Or you go to a restaurant and you can’t figure out what’s on the menu. 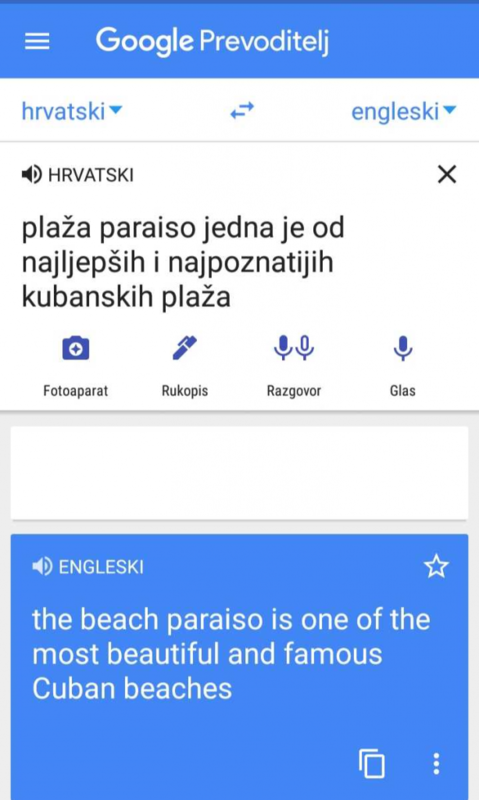 Google Translate can help you. Simply choose your source and target language, point your phone camera to the text and Google Translate will automatically translate it. You can translate handwriting the same way. Of course, more readable handwriting equals more accurate translation. Also, you can use the Handwriting option where, instead of typing, you can write the text you want to translate directly on your phone display. You’re on a trip. Let’s say Cuba. You want to get to Playa Paraiso, one of the most beautiful and most popular Cuban beaches, but you don’t know how to get there. You meet a local called Juan on the street, but Juan doesn’t speak English. If the vocabulary from Mexican soap operas doesn’t help, use Google Translate and instantly translate everything Juan says. With Google Translate you can translate a whole document in Word, PDF or any other supported format (.doc, .docx, .odf, .pdf, .ppt, .pptx, .ps, .rtf, .txt, .xls ili .xlsx). You will not be able to download the document in the source format, but only to view it on your display. We recommend using it only when you need a basic understanding of a text to see what it is about. For professional translation, choose a translator with appropriate knowledge and experience. 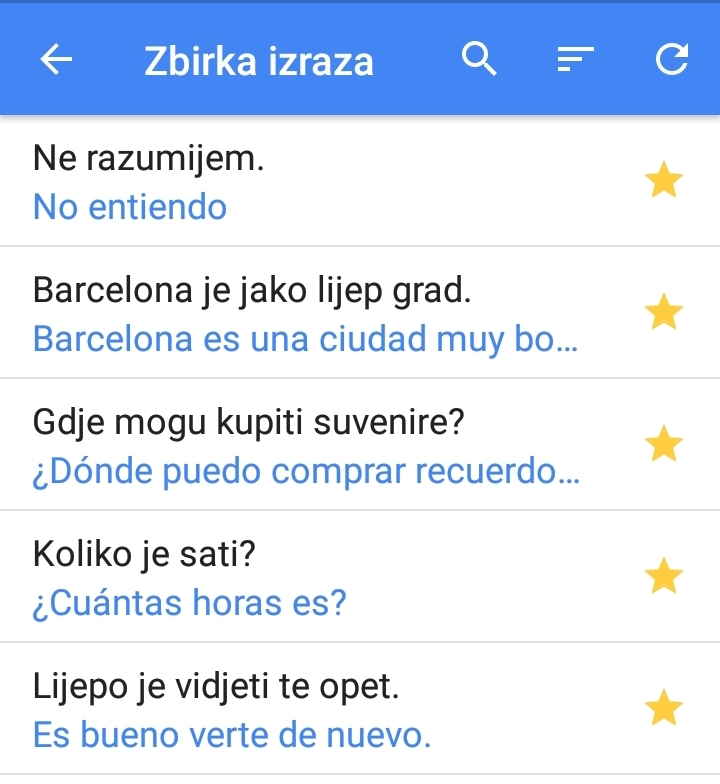 Google Translate enables you to save common phrases in your personal phrasebook. These can be phrases you often use but just can’t remember or those you’ll need while traveling and enjoying the abovementioned trip to Cuba. Simply translate the phrase and tap the star icon next to it. You can access your phrasebook by clicking the Menu – Phrasebook. That’s it! You’re ready to go to Cuba! How often do you use Google Translate? Have you already used these features?